It’s been a bit over two months since the previous post. In it we learnt how to define simple functions that don’t take or return any parameters. We also learnt that we need to declare a function if we’re calling it at a point in our program where it hasn’t been defined yet. Today we’re resuming the course exactly where we left it. If you need a refresher then go ahead and re-read the previous chapter. As always, don’t hesitate to ask questions in the comments below if anything isn’t clear. Any variable that we define inside a function will be a local variable. This means that the variable is only available from inside the function where it is defined. We can even use the same variable name again and again inside different functions without conflict. The program above defines two functions: main(), which we always need, and aster7(). Both of them use an integer variabled called i. main() uses it to create a loop that calls aster7() five times, and aster7() uses a different variable with the same name to run a loop that prints 7 asterisks. Each of the variables is local to the function that defines it, so they don’t conflict with each other. 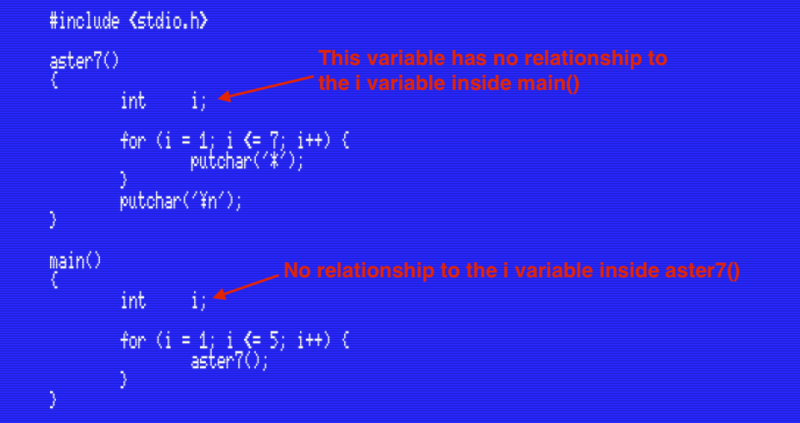 This is because both i variables are local and isolated from the i variable in any other function. 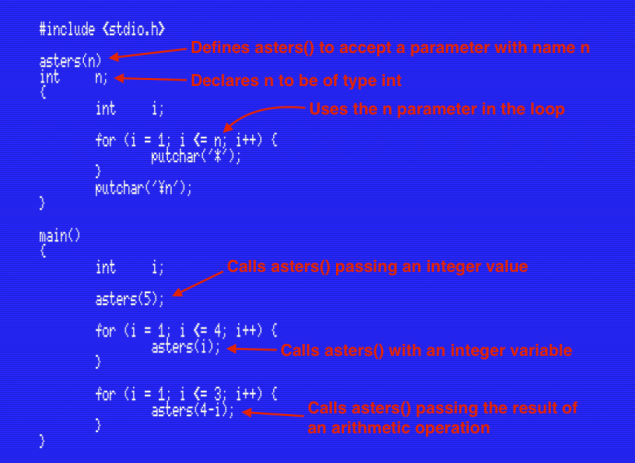 Changing the i variable inside aster7() doesn’t affect the i variable inside main(), and vice versa. Compare this with how this would work in MSX-BASIC. BASIC has no concept of local variables, so we can’t use the same variable name in two different places at the same time without affecting the whole program (for example, a FOR loop using the I variable that calls a subroutine that changes the I variable). Local variables give C a very important advantage over BASIC: in BASIC, writing a big program involves keeping track of variable names in order to avoid changing them by mistake somewhere else in the code. In C it’s easy to split a big program into several simple functions with their local variables, without having to worry about how variables are used elsewhere. The function aster7() in the program we’ve just seen always does the same thing: it prints 7 asterisks. We can easily make this function more useful by modifying it so it accepts a parameter indicating how many asterisks we want it to print. A function can have as many parameters as we want and these can be of any type. However, each parameter can consist of only a single value. This means that we can’t pass a whole array as a parameter to a function (but there’s a way to around this that we’ll see when we learn about pointers). As you can see, we can pass any expression as a parameter, as long as the resulting type of the expression matches the type of the parameter. In this particular case, the parameter of the asters() function is an int, so we can pass it anything (a value, variable or expression) of type int. Whenever we call a function it is very important to ensure that the values we pass are of the appropriate type. Otherwise, the function will most likely not work as expected. Remember that we described these type-related rules some time ago when we described the data types in MSX-C. The second version is shorter, but it isn’t easy to understand what the first printf() does. If we’re working on a big program and have to debug it sometime in the future, the first version will be much, much easier to fix. Consider splitting your programs in functions for readability whenever possible. Most of the time a function executes all the instructions it contains and then returns to the code that called it. However, it is possible to stop its execution at any time using the return statement. A function can be aborted at any point, even from deep inside a loop. In this post we’ve learnt about local variables and how to define functions that accept parameters. We’ve seen how to make sure that the data passed to a function is of the appropriate type, and we’ve learnt how to abort the execution of a function at any point. In the next post we’ll learn about the most useful type of functions: the ones that return values. We’ll also learn about the VOID type. Thank you, this was a great, very informative, post.